This year’s TdF, or TdWTF as Cervelo’s Gerard Vroomen has been calling it, seems to have been especially rife with crashes. One of the most recent spectacularly scary crashes was when Laurens ten Dam endo’ed over his bars going around a corner on stage 15. It looked (at least to me), as if he got pushed to the outside of the road, then off the road, and then was trying to ride off road when he hit some sort of obstacle that launched him fully over his bars. The first check, of course, is for a neck or spinal cord injury, which he thankfully didn’t seem to have sustained. Next check, a la Chris Horner, would have been for concussion, and again, thankfully, that seemed negative as well. But his face took a serious beating, and easily could have been fractured. But ten Dam soldiered on to the end of the stage, and then had his face x-rayed to confirm, again very luckily, that he had no broken bones. 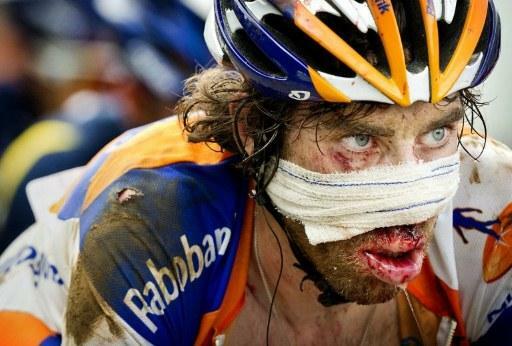 But he did need eight stitches, which he simply said was, “25 less than Johnny Hoogerland.” And, today, with a bandaged face, ten Dam was on the starting line because, “You don’t quit the Tour because of a thick lip.” Well, if you’re a BAMF you don’t.